Lock in a great price for Brilliant Hotel – rated 8.8 by recent guests! My wife and I love the breakfast buffet , it has large selection of food specially the Quang noodles it is very tasty. We also much of appreciate the service of waiter and waitress at breakfast . Wonderful view from room, which was spacious and lovely. Breakfast was diverse and delicious. Spa services were great as well, they were able to accommodate our last minute booking. Good breakfast and overly attentive staff. Partial views of river. Daughter had view of water tanks, although we had booked room as “no view”, but for one night was ok. Good bathrooms/bedrooms and strangely, condoms part of minibar/snacks basket. We booked Riverview room and it has a breathtaking panorama of the bridge at night. Breakfast option is excellent, ranging from Continental to Asians. Staffs are friendly and willing to help. Brilliant hotel is closed to Han River and shopping center (cho Han) and Cathedral Catholic Church. The bed very comfortable, and the location is near to restaurants, coffee shops and han market. Absolutely beautiful hotel in an excellent location right on the river. We did have a huge JR suite with a wonderful river view so nothing to complain about there. Excellent rooftop bar and restaurant; ate there both nights. Excellent staff. Couldn't be happier with choosing this hotel. I stayed at Grand Suite room, good view, facing Han River, view sun rise and Dragon bridge from room. Breakfast is good, serve local foods and fruits, and western foods. Complimentary coffee at 17th floor was very good, staff very friendly. Pink Cathedral just beside Hotel building. Han market 5 minutes walks. Staff so helpful and kind. Especially the doorman Phan Hao! He had some great advice and was really pleased to see us walk back in with exactly what we were looking for. AND the bottomless and free Vietnamese ice coffee in the Brilliant Top Bar was the best we have ever... ever had. Great place for a short stay if needed when going through DaNang. Brilliant Hotel This rating is a reflection of how the property compares to the industry standard when it comes to price, facilities and services available. It's based on a self-evaluation by the property. Use this rating to help choose your stay! 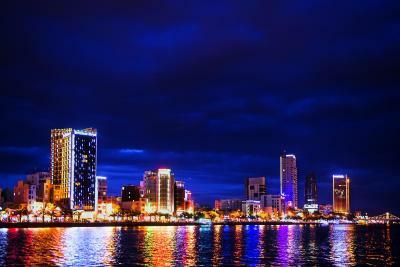 One of our top picks in Danang.Centrally located in Danang City, the 4-star Brilliant Hotel offers panoramic views of the Han River. It features 3 dining options, free Wi-Fi access and complimentary parking. 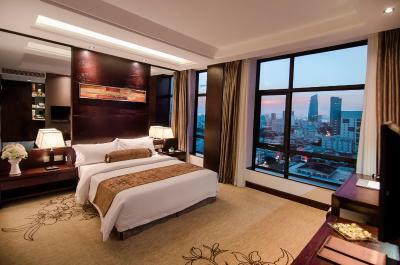 Fully furnished, the elegant rooms come with modern interiors and floor-to-ceiling windows. All are equipped with a flat-screen cable TV, mini-bar and comfortable seating area. Bathrobes and slippers are provided. Staff at the 24-hour front desk can assist with luggage storage, laundry, ironing and concierge services. Guests can also use the facilities in the business center. Senses Riverside Restaurant serves a breakfast buffet, as well as local, Eastern and Western dishes. Other dining options include Fusion Lounge Restaurant and refreshing drinks at Brilliant Top Bar. 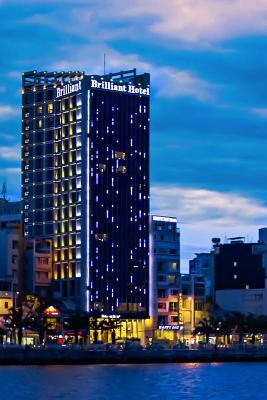 Hotel Brilliant is 1.2 mi from Da Nang International Airport and 4.3 mi from Son Tra Peninsular. It is a 45-minute drive from the UNESCO Heritage Site of Hoi An and a 1-hour drive from My Son Sanctuary. When would you like to stay at Brilliant Hotel? This air-conditioned room opens up to views of the city and partial views of the river. It features a flat-screen cable TV and private bathroom with a shower. Offering additional living space, this air-conditioned room features a flat-screen cable TV, seating area and private bathroom with a bathtub. 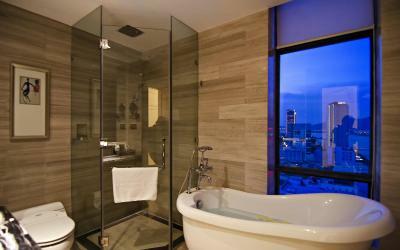 Overlooking the beautiful Han River, this room features a flat-screen TV, seating area and private bathroom. 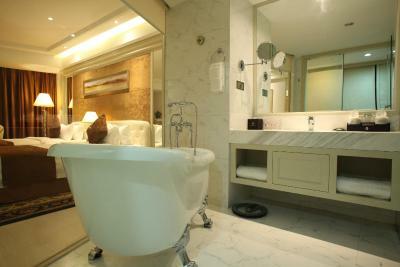 Spacious suite features a separate living room, flat-screen TV and private bathroom with a spa bathtub. Guests enjoy views of the beautiful Han River. This spacious apartment features 2 separate bedrooms. It has a kitchen with kitchen utensils and a private bathroom featuring a spa bathtub. This spacious apartment features a separate bedroom. It has a dining area and a comfortable seating area. This spacious apartment features 2 separate bedrooms. It has a dining area and a comfortable seating area. This air-conditioned double room has a seating area fitted with a flat-screen cable TV. The private bathroom is equipped with a shower. Please note that this room does not offer views, and it does not accommodate extra beds. This air conditioned twin room has a seating area fitted with a flat-screen cable TV. The private bathroom is equipped with a bathtub. Please note that this room does not offer views. Offering additional living space on the lower floors, this air-conditioned room features a flat-screen cable TV, seating area and private bathroom with a bathtub. This room features city view and partial river view. 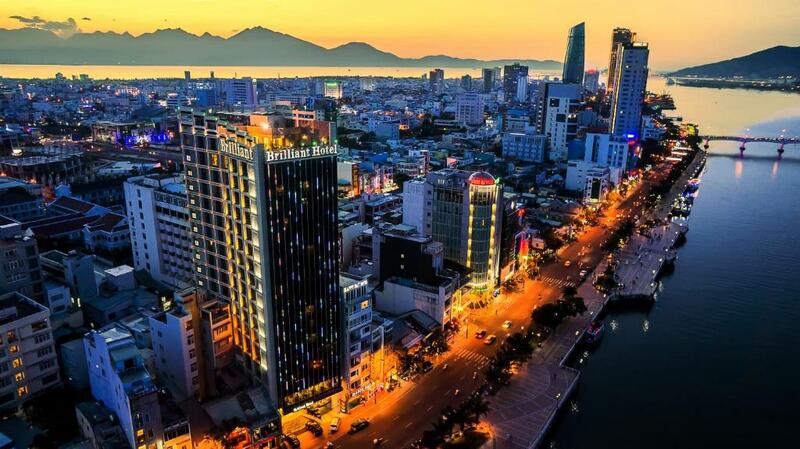 The Brilliant Hotel is located at a prime location on Bach Dang Street, one of the most beautiful ones in the heart of Danang city, overlooking the scenic Han River with its famous bridges and a fantastic view of the beach city. Just 10 minutes-drive from the international airport, the hotel is ideal for travellers to explore the charm of historic and modern city with points of interest such as Da Nang’s new Administrative Centre, Con Ga Church, the Cham Museum, Han market, shopping malls, restaurants and bars. Combining luxury and elegance in contemporary European and Asian architecture with Vietnamese hospitality, Brilliant Hotel is a truly home for both business and travelers in Danang. The hotel is tastefully designed to provide space and comfort with top of guest amenities in the international standards of a four-star hotel as well as brings fully comprehensive services to meet all guests’ need. 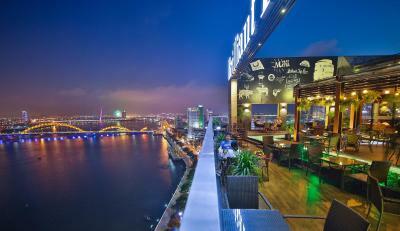 Brilliant Hotel aims to become one of the most favourite hotels in Danang. House Rules Brilliant Hotel takes special requests – add in the next step! Brilliant Hotel accepts these cards and reserves the right to temporarily hold an amount prior to arrival. Very hot in the swimming pool area. Great breakfast with excellent service. I loved everything about my stay at Brilliant and the name suits it well. The room the view the breakfast the position on the riverside were all fantastic. Nothing. Lovely experience all round. The breakfast looked wonderful. There were many dishes to choose from however, each and every one included meat - which I don't eat - but there was an egg station, breads and fruit. The staff were superb - the doorman, reception, spa, breakfast - they were all lovely. It was our anniversary and I had mentioned it in order to get a river view room and the staff made a lovely display in the room with rose petals upon arrival. I wish you guys will be more qualified to speak foreign languages communicationg with tourists. Everything except for things that i've mentioned. Great location in the center of town, excellent service, comfortable room with a wonderful view over the Dragon Bridge, superb breakfast.. really, nothing to criticise. Room was beautiful with a great view. Morning breakfast was fantastic. Very tired decor. Staff not flexible on meeting customer's needs. Gym and swimming pool depressing and breakfast very mediocre. I stayed 3 days in the hotel. It was so clean, so quiet. and the river view is very great at night. The staffs are very kind, especially Mr. SON is very friendly to say hello and talk to me. and we bacame friend soon.